Britain, the not-too-distant future. Idir is taking the British Citizenship Test. He wants his family to belong. Twenty-five questions to determine his fate. Twenty-five chances to impress. When the test takes an unexpected and tragic turn, Idir is handed the power of life and death. Holy sh*t that was a mind f*ck. Sorry, but there really wasn't another way to put that. This book truly belongs as an episode of Black Mirror. It's shocking, it's engaging, and it really messes with you. 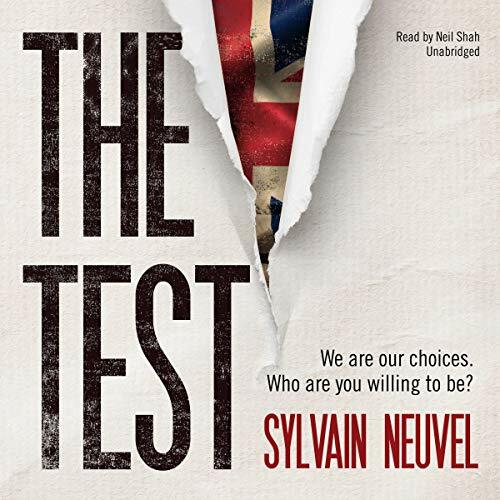 The Test by Sylvain Neuvel is truly a novella that is going to stick with you long after reading it. I listened to the audiobook of it. The narrator (Neil Shah) was perfect. He was able to capture the characters perfectly and his accents and voices were brilliant. This audiobook was extremely well done. I was engrossed in the first minute of the audiobook and I didn't want it to end. I cannot wait to see what Sylvain Neuvel comes up with next. This was brilliant. Wow! Just wow. Akin to a Black Mirror episode. Couldn’t recommend more if I tried. So good. Like no other short story I have read / listened to before. Amazing. I can't really add to the previous reviews. This would be as top five black mirror episode, emotional rollercoaster. I recommend. A roller coaster ride from start to finish. I only wish that there were more short stories like this about other tests. it was great to listen to something truly original, very well written, plus extremely well performed. This short 2 hour and 12 min audiobook leaves the reader with a lot to ponder even after you finish the book. Very much in the same vein as a Black Mirror episode, it centers around a Iranian immigrant to Britain taking the British Citizenship test somewhere in a dystopian future, but all I'll say about the plot is that it isn't as simple as that. A great short 4 out of 5 star read for its intriguing plot. I read this book because I loved the Themis Files by Sylvain Neuvel and was much looking forward to this one. I was not disappointed. I really enjoyed this little novella. The conecpt was well executed, the characters were great. I only wished it was slightly longer, maybe it could have been 3 hours instead of 2 hours. It was great either way though. I can't wait to read whatever Sylvain Neuvel releases next.